VpCI-329 F is a USDA (US Department of Agriculture) accepted oil-based concentrate for use as an additive to lubricating and hydraulic oils or as a ready-to-use corrosion preventive fluid. VpCI-329 F protects in two unique ways. First, oil-soluble corrosion inhibitors offer a tenacious film which clings to metal surfaces, providing excellent contact corrosion protection. In addition to this film barrier, Cortec VpCIs release vapor phase corrosion inhibitors into the air that attach electrochemically to the metal surface. VpCI-329 F is a special version of VpCI-329, which has been accepted by the USDA "for use on packaging materials in indirect contact with meat or poultry" Conforms to FDA regulation, CFR 178.3300 Corrosion inhibitors used for steel or tinplate; for indirect food contact. 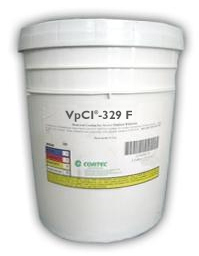 Dilute VpCI-329 F with lubricating, hydraulic, or preservative oil. Can also be sprayed, dipped, or brushed onto surfaces. Short-term protection (up to 6 months): 1 part VpCI-329 F to 20 parts oil. Medium-term protection (up to 12 months): 1 part VpCI-329 F to 10 parts oil. Long-term protection (up to 24 months): 1 part VpCI-329 F to 5 parts oil. Available in 5 gallon plastic pails (Cortec Product # 12000146) or 55 gallon metal drums (Cortec Product # 12000147). 5 gallon drum weighs 50 pounds and ships under our standard shipping rates. The 55 gallon drum must be shipped by truck. We will provide you with a freight quote before we ship this product. The product should be stored sealed. Agitate before each use. VpCI-329 F has a shelf life of 24 months in sealed drums.